I recently picked up knitting again after ignoring my poor knitting needles for a few years, and just in time for Halloween! I started thinking about all of the Christmas gifts that I could knit or crochet and then it hit me that there were surely projects that I could do for Halloween, right? So I started looking and found some wonderful decorations for the holiday that are so easy and fast to work up that they can be done in an afternoon. Whether you’re looking for bathroom or kitchen decorations or some cute knitted pumpkins, I’ve found 25 of the most adorable hand knit and crocheted Halloween decorations for your home! I’m really excited about these…mostly because they’re all super easy. I’m not a professional knitter by any means, so the easier the pattern the better. These are all fairly easy and are filled with Halloween colors, spooky designs and just all out fun. I can’t wait for you to try them! If you love making your own decorations and you love to knit or crochet, this is definitely the list of projects that you need to see. And, if you do really love making your own DIY Halloween decorations, you should take a minute to check out these 25 reclaimed wood Halloween decorations. I always love making my own…. well, everything that I can. These knit and crochet projects make me so happy. There are cute little dishcloths, a gorgeous candy corn throw and even cup sleeves, decorative garland and pumpkin ornaments. There are also some great dolls that you can knit up in no time and even a great bowl that looks like it has bugs coming out of it. Imagine the fun that you will have creating all of these ghoulishly fun patterns! I’ve also got a great list of 100 crochet projects for beginners that you should take a look at. They’re all super easy, too and perfect for gifts for the upcoming holidays. 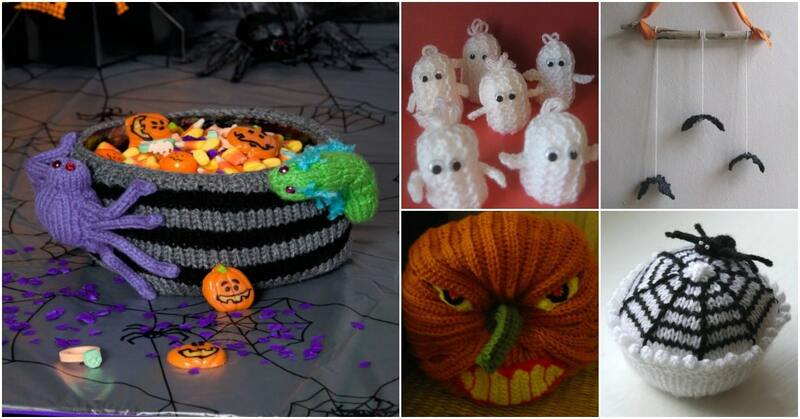 Whether you have been knitting for years and know every stitch in the book or you have just started your knitting and crocheting journey, you’re going to be able to follow these patterns and make some wonderful Halloween decorations. I can’t wait for you to try these and let me know what you’ve made! 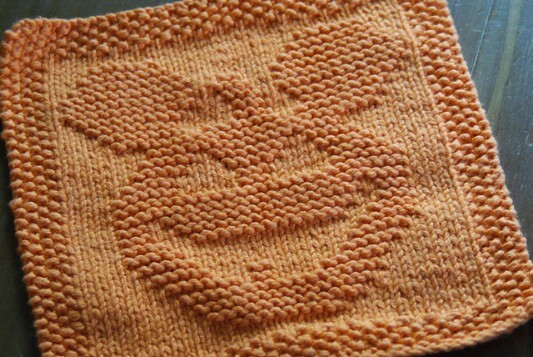 Decorate your kitchen for Halloween with this Mickey Mouse inspired Halloween dishcloth. The cloth has Mickey’s face and you do it in great Halloween colors. 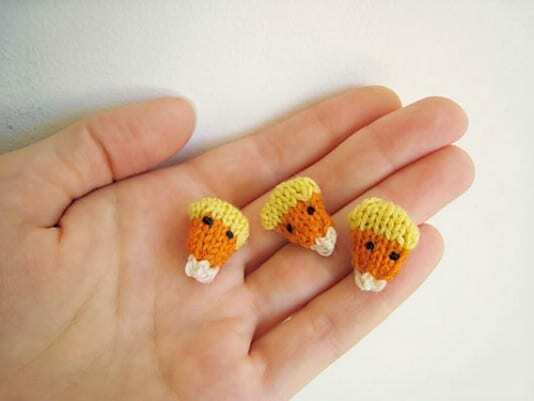 You don’t even have to be a seasoned knitter to pull this one off. It’s really easy and you don’t have to know any complicated or advanced stitches. This one would make an excellent gift for someone you know who loves Halloween and adores Mickey Mouse. Crank your Halloween decorating up a notch with this super easy bat mobile. It knits up in no time and you can hang it from anything, including a twig from the yard. 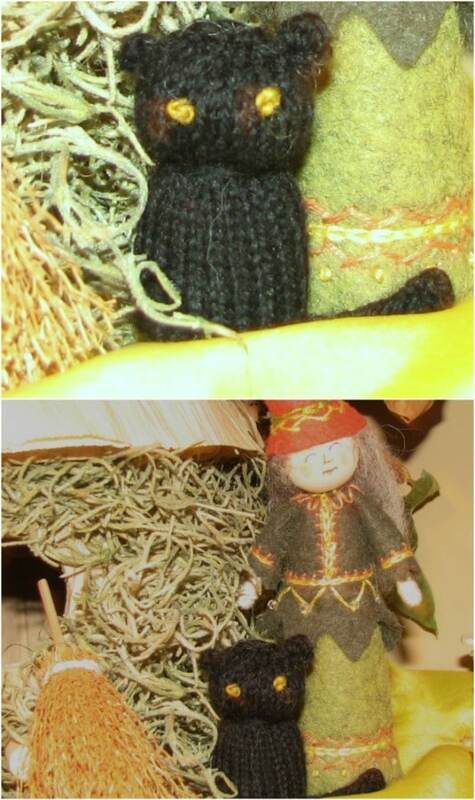 You use black yarn to make the little bats, which are really adorable by the way. 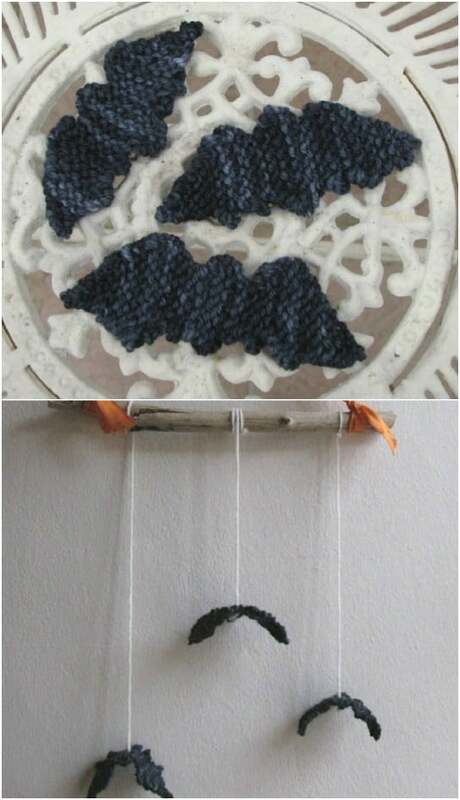 Just knit as many bats as you want…they take very little time… and then hang them up to add some spooky fun to your Halloween. I love this little black cat diorama. If you like decorating with ornaments for Halloween, this one is a must. It’s a really easy pattern to follow and is filled with wonderful colors and designs. You could even change the colors up on this one and use it for Christmas decorating. I found the pattern on Etsy for just $4 and you get an instant download so you can start making these today! These little square coasters spell out Boo and they’re so adorable. They’re also super easy to knit and you don’t need to know any advanced stitches or complicated pattern language. 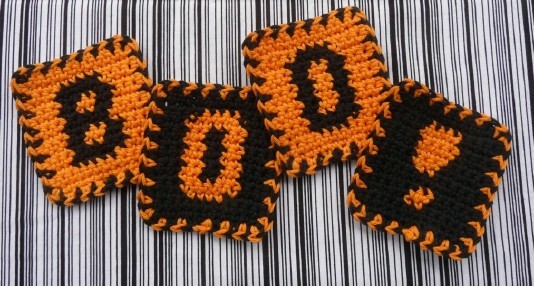 If you can knit a simple washcloth then you can easily knit these coasters. Make a few sets for all over the house or you could even turn these into a great garland by just stringing them up with line or twine. This bowl is my favorite! It’s so spooky and fun and it’s an easy pattern to follow. Even the bugs are pretty easy to make. This would be the perfect candy serving dish for your Halloween party or to hold your candy for neighborhood trick-or-treaters. It’s a super fun and easy bowl to make and you’ll be so proud to show this one off when it’s finished. Your candy corn doesn’t have to be filled with sugar. 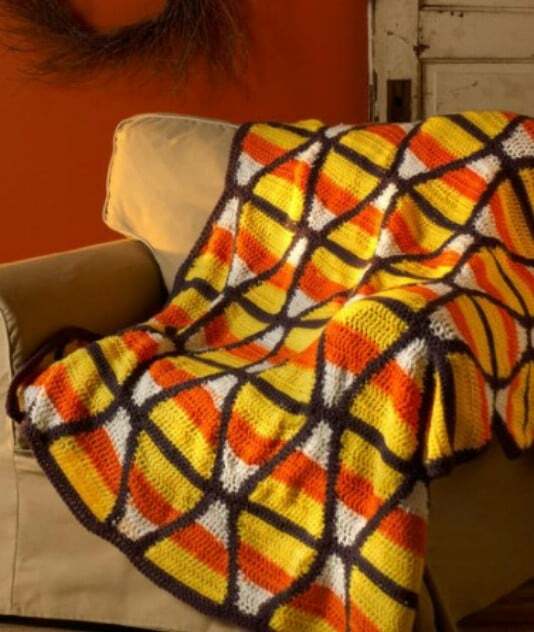 This candy corn throw is the sweetest thing I have ever seen and it’s a pretty easy blanket to crochet. You’ll need to get your yarn in the right colors and get used to working with multiple colors if you have never done that. Overall, this one is not at all complicated and the finished project is absolutely gorgeous. 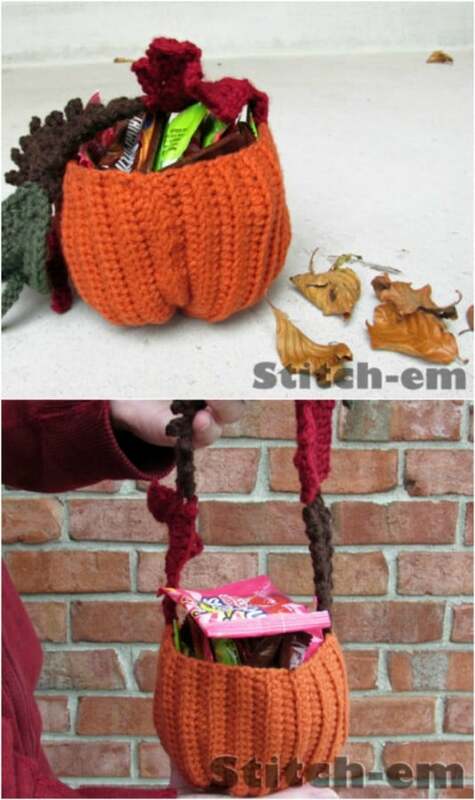 Your kids will be the envy of the neighborhood with this knit trick-or-treat bag. You line it with felt so there are no worries of candies falling out the bottom. The jack-o-lantern design is really sweet and the pattern is really easy to follow. You do need to know how to change colors to make the design but it’s not at all difficult. Not only is this little puppet adorable, he’s super easy to knit. The pattern is actually listed as very easy and perfect for beginners. You only need to know the basic garter stitch and this one works up really quickly. 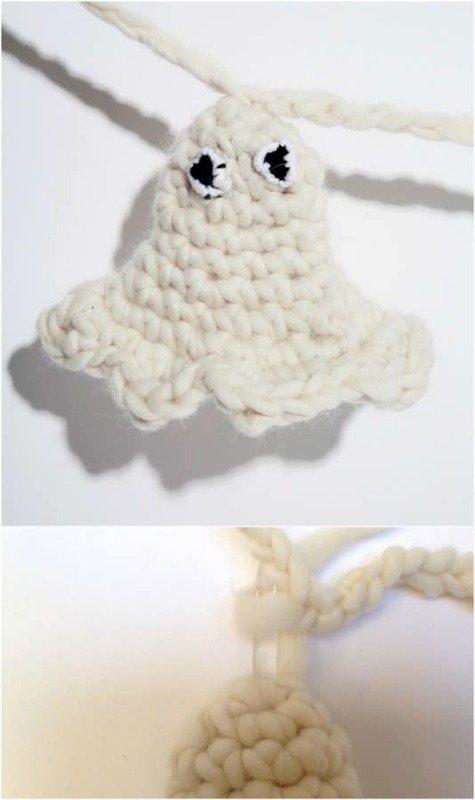 You’ll have time to do several of these before Halloween and kids are going to love playing with this knit ghost. You could also do a few of these and just hang them around the house for decorating. 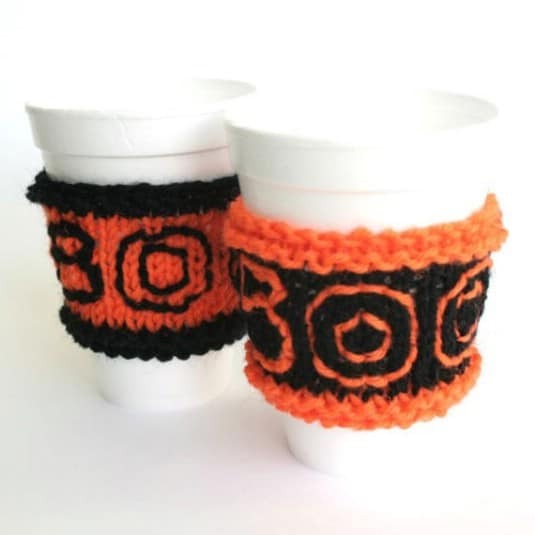 Since these cup sleeves are so easy to knit and work up so quickly, you have plenty of time to make one for everyone at your Halloween party. These also make wonderful gifts and are so colorful and fun. You don’t need any advanced knitting knowledge and you can probably do one of these in an afternoon, even if you’re completely new to knitting. 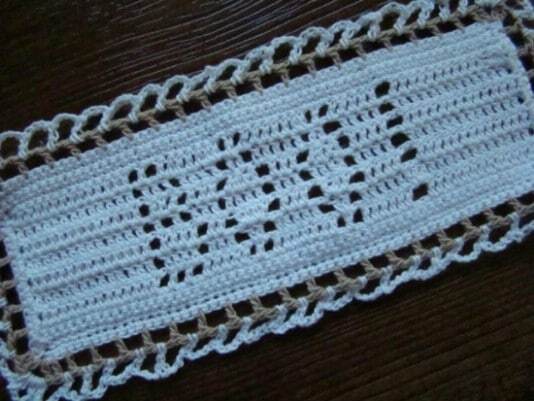 This doily is gorgeous and it’s pretty easy to crochet. I think it would look really great in purple and orange but you can do any colors that you want. It works up pretty quickly and is a good project for first time or new crocheters who may want a bit of practice before taking on harder projects. This little ghost garland is so cute and so easy to crochet. You can make as many or as few little ghosts as you need and they work up really quickly. You use a chunky wool blend yarn. 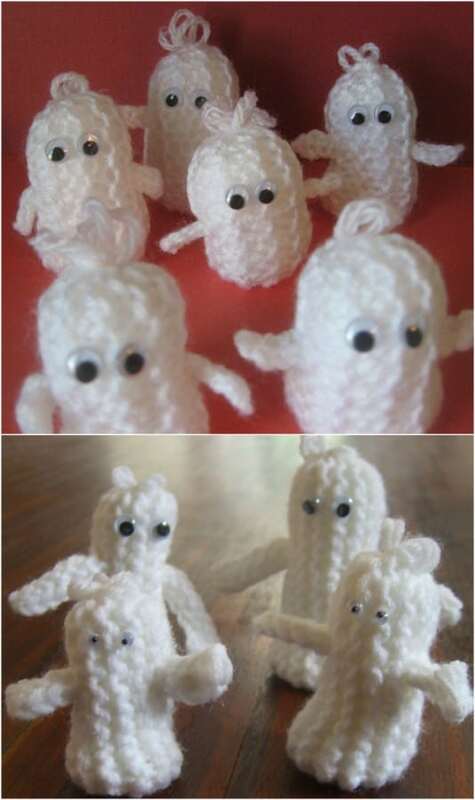 Each little ghost is made separately and you keep them joined with the crocheted string that they hang from. This is the perfect decoration for parties or for anyone who just wants a little crochet practice. Here’s another cute pattern for Halloween ghosts. These are really easy to work up and you can turn one out in less than an hour, even if you are new to crocheting. If you want decorations that you can put up all over the house, these are perfect. They’re also great for gifts for school parties or to add to your treat bags if you’re planning your own Halloween party at home. 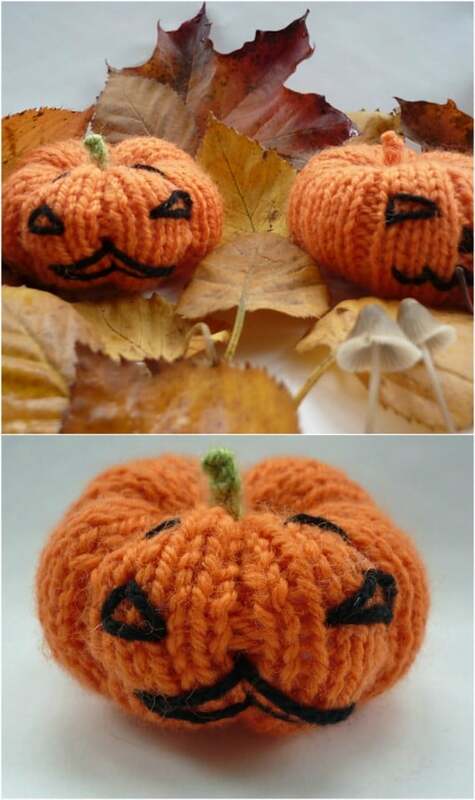 You just need basic knit, purl, increase and decrease skills to make these adorable little pumpkins, and they can be made with yarn that you have left over from other projects. They work up so quickly that you can get more than one done in an hour and they’re perfect for decorating around the house or for use in goody bags for your Halloween parties. 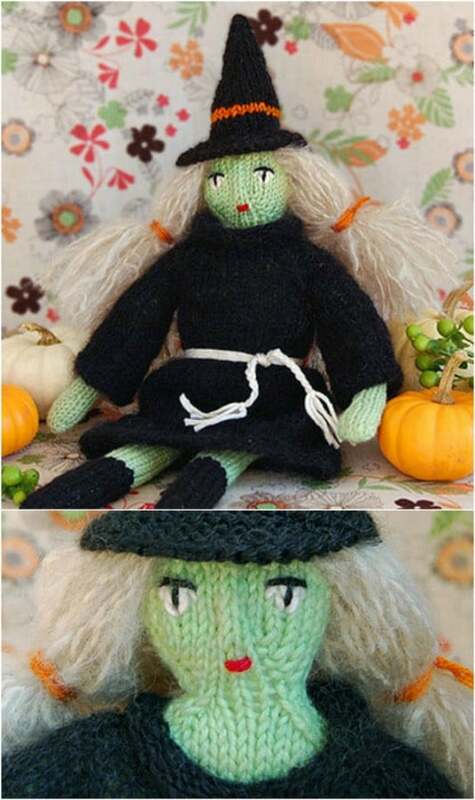 Dress up a table with this spooky witch doll, or they make wonderful gifts. This one is a bit more advanced than others but still really easy for anyone who has knitted before. If you’re a first time knitter, just follow the pattern closely. It’s pretty easy to understand and you don’t need to know any really complicated stitches. You’ll love this one when it’s finished and will adore her sitting on your party table between your Halloween party foods. These little spiders can be used to decorate in so many ways. 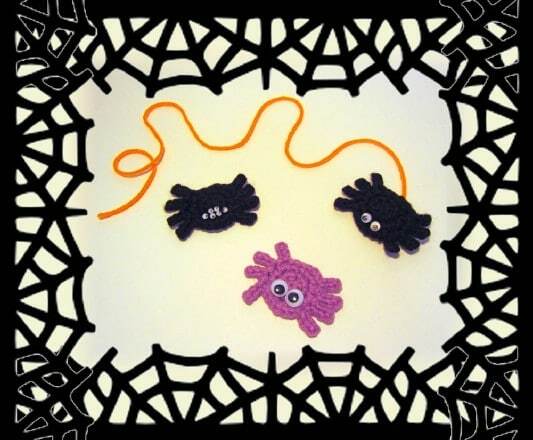 You could use them as appliques to create Halloween clothing and other décor or just leave them strategically placed around the house for added decoration. They work up super quickly and you don’t have to be a seasoned crocheter to make them. You can use this pattern for practice as you just have to know basic skills and you can turn them out so quickly. This little black cat is sure to steal your heart and become your favorite Halloween decoration. This pattern is a bit more complex than some others but still totally doable no matter what your knitting skill level. You won’t use much yarn as he’s pretty small but you could adjust the pattern to make him larger if you want. He’s perfect for sitting on a table or mantel or you could create an entire family of little black cats. Don’t let the tiny size of these little candy corns fool you, they pack a powerful decorating punch. They’re so easy to make and will work up in no time. In fact, they’re so simple that you could make an entire bowlful of knit candy corn in an afternoon. I love how adorable they are and they’re perfect for adding extra embellishment to any of your other Halloween decorations. 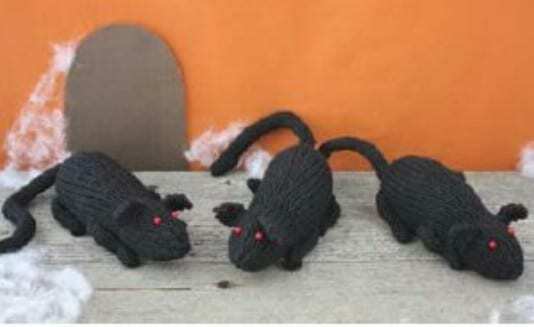 This knit rat pattern is listed as intermediate and may require skills from a more seasoned knitter. You can try it as a first time knitting project, though. It only takes one skein of yarn to make each one so you can have an entire collection of these depending on how much yarn you want to buy. The pattern is really easy to follow and again, can certainly be done by beginning knitters. Just expect this one to take a bit longer than some of the other patterns. 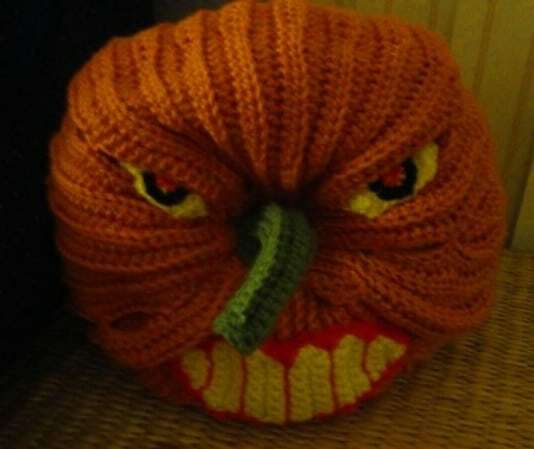 Here’s another great pumpkin that you can crochet and this one has a super scary face! It’s a pretty easy project, although it does require you to know a few advanced stitches and techniques. I love the coloring and you can alter the size to make him larger and scarier if you prefer. He’s perfect for decorating anywhere in the house and works up pretty quickly even for first time crocheters. 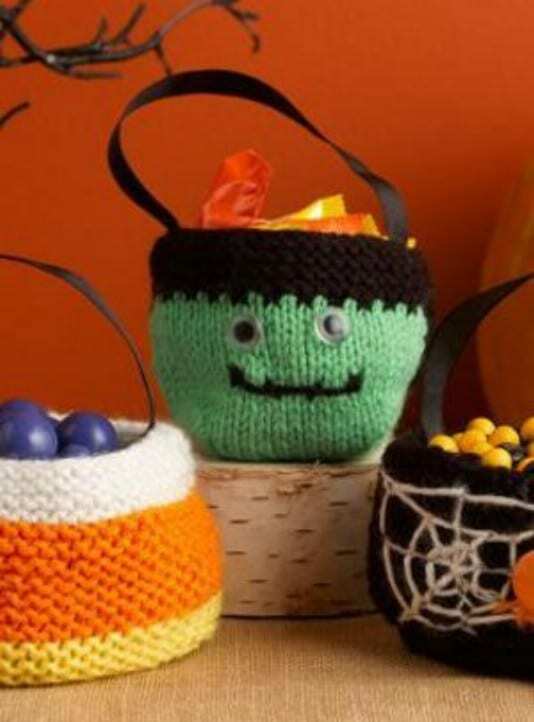 This little crocheted pumpkin basket is perfect for trick-or-treating or just filling up with candy and sitting on a table. It’s a pretty easy crochet project and has lovely leaves that give it great accent colors. The leaves are all different shapes and sizes, so there are different patterns for those. You’ll create the basket first and then crochet your leaves to be sewn on after it’s all finished. 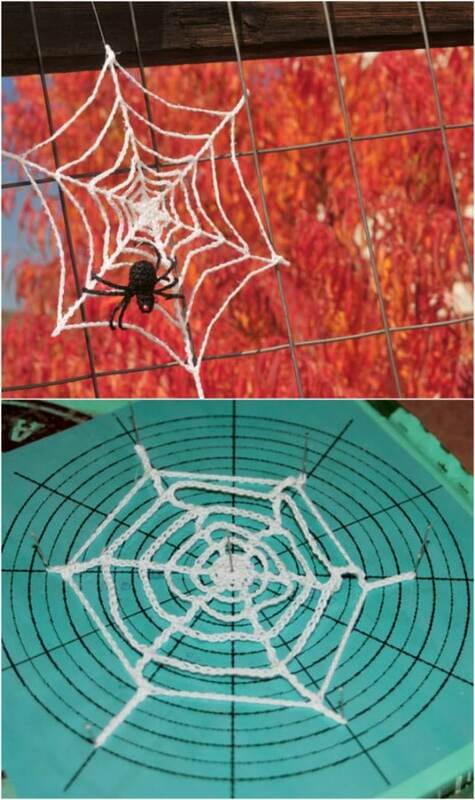 If there is an easier crochet project for Halloween than this spider web, I haven’t seen it. This is so simple and these are really gorgeous when they’re finished. You just can’t really mess these up. 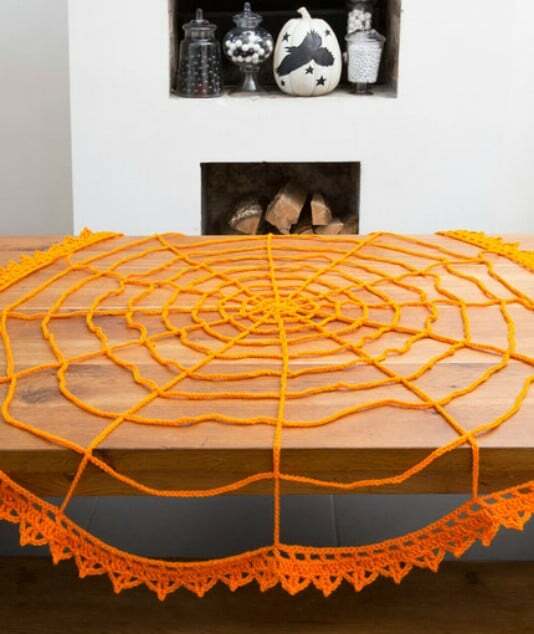 Just crochet the web and then add in your homemade spiders or you can buy spiders to display. These would be great hanging all over the porch or house and literally work up in just a few minutes each. 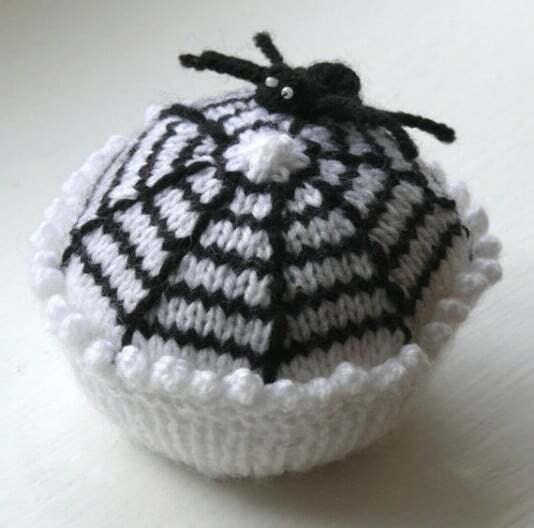 This little knit spider cupcake is sure to be the hit of your Halloween party table. This pattern is relatively easy and makes the most adorable decoration. Only minimal seaming is required, which makes this one pretty simple and it works up rather quickly. I found the pattern on Etsy for under $5 and you get an instant download, so you can start on this one right away. 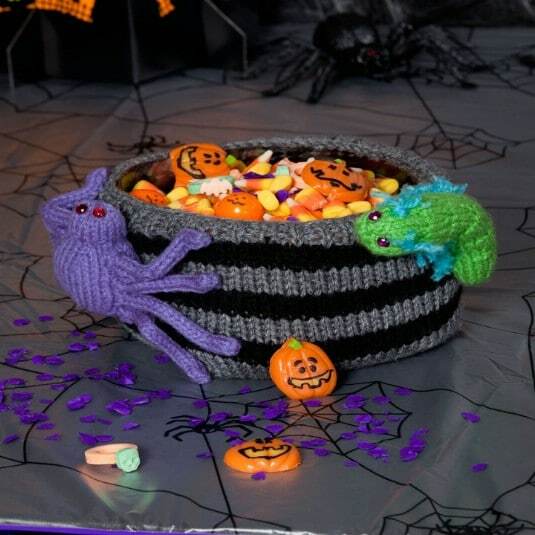 Here is another really easy and really fast crochet project for Halloween. This table topper won’t take you long at all to work up and it’s perfect for decorating for Halloween parties. It just takes one skein of yarn and while the pattern calls for pumpkin, you could use any color that you wanted to make this one. You could probably do smaller versions of this as doilies if you alter the pattern just a bit. These little treat bags are so easy to knit and they’re super adorable. Your little ones are going to love carrying these trick-or-treating, or you could make up a batch to use as goody bags for your Halloween party. The pattern can be used to make candy corn bags, Frankenstein bags or spider bags and they are all pretty quick to work up. 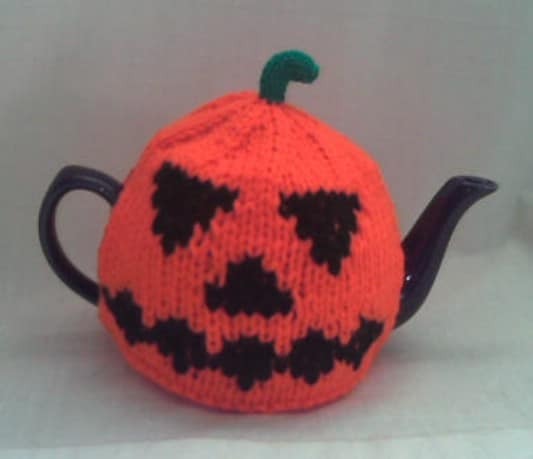 This tea cozy is the perfect way to add some Halloween cheer to your kitchen. It’s a pretty simple and quick project to work up and the pattern includes a free dishcloth pattern to match your tea cozy. I found this one on Etsy for around $4 and it’s a really adorable cozy for that tea kettle.